I have to say, I don’t really like yesterday’s gospel. At all. Honestly, I get a little mad thinking how upset the day laborers who spent twelve hours toiling… but they were not subject to any generosity. Instead, they got to see everybody else get something extra, where they got nothing extra. I mean, just look at the gospel! Rembrandt did a painting of this parable. Some workers surround the generous landowner with an outstretched hand, asking why they didn’t get anything extra. Still others talk among themselves about what they received behind the landowner’s back. And the landowner, looking rather cheery, has a kind of kind, yet exasperated expression on his face. 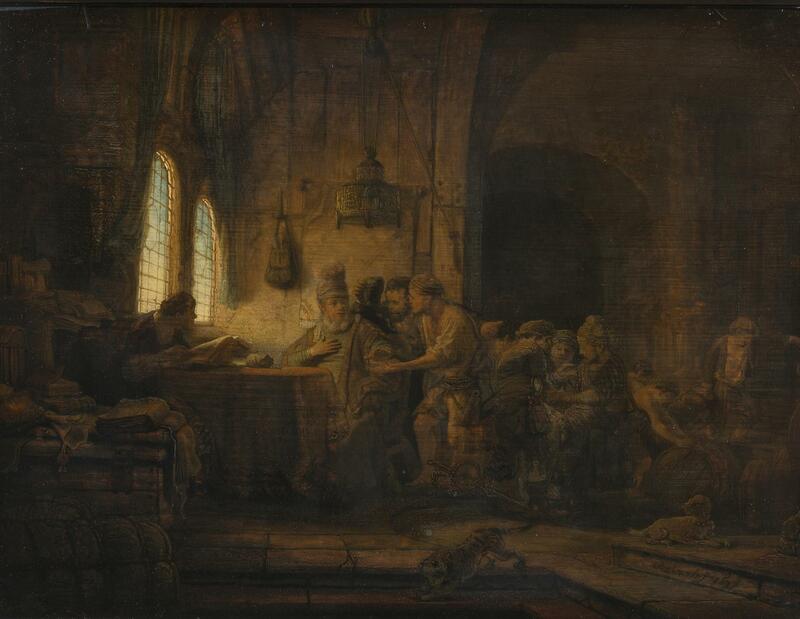 The Parable of the Laborers in the Vineyard, by Rembrandt Harmenszoon van Rijn, c. 1637. State Hermitage Museum, St. Petersburg, Russia. To make matters even more unfair, the landowner goes several times into the marketplace, recruiting everybody he can find… and no matter when he goes, he always seems to find people standing around with nothing to do. The people toward the end that say that they’ve been waiting around all day for work, but nobody hired them? Yeah. They’re lying. If they had been truly waiting around, the landowner would have already picked them up by now. And yet, the landowner picks them anyway. Then, instead of giving them their fair share, he is generous with them when, realistically, they deserve absolutely no generosity or compassion from the landowner. None at all. Then, when it comes time to the people who actually did work, instead of being similarly generous with them and giving them more than their fair share, he sends them away with the agreed upon amount, all the while claiming that he is generous. Even though he was hardly generous to them! It always seemed remarkably unfair to me. Maybe it seemed remarkably unfair to you? There is a temptation to put yourself in the shoes of the worker who’s worked all day, and is justifiably angry with the landowner. It is harder to put yourself in the shoes of those who are late. After all, to put yourself in those person’s shoes means that you’re putting yourself in the shoes of someone who is rather lazy, or maybe too depressed to even get up out of bed — or maybe even a little bit of both of those things. After all, being unemployed is a miserable experience that I would not recommend for anyone. It’s hard to put yourself in the shoes of someone who genuinely doesn’t seem to get the point that there is work to be done. And, worst yet, it’s hard to identify with someone who, when directly confronted about their inadequacies, lies about it using the poorest and most see-through excuses ever. And yet… how does God see us? I would wager that He would see us as more of the latter. After all, are we perfect at the vocation that God has set in front of us? Do we try to get by with half-measures or try to avoid responsibilities? I don’t know about you, but as a wife and mother, I’m sure that my husband and children have a list a mile long of things that I could do better. And God knows all of my inadequacies, even the ones that I would blush and lie about if confronted about it directly by most people. I am not perfect. Not by any stretch. And to sin and be a sinner means to “miss the target” or to not be perfect. And I am a sinner. So, the fact that God treats these miserable sinners who have failed so hard in so many ways with so much compassion gives me hope. Because, I don’t know about you, but that sort of generosity would lift my soul and make me think that maybe — just maybe — I wasn’t a complete failure. Maybe this God person saw something in me that perhaps I never saw. Maybe He showed me a way to work as His servant, even when I felt that there was nothing that I could possibly do for Me. And it would inspire me to hope more, to sacrifice more, and to work harder to deserve the generosity of God — even though deep down, I know that there is absolutely nothing that I could do to fully deserve that kindness that He showed me in that dark time in which I failed utterly. So, three cheers for God for being so generous with those people who worked little, yet received so much! Was it unfair? Undoubtedly. Was it a divine act of generosity to people who didn’t deserve it? Most definitely. May we, as Christians, treat others with the same level of generosity! Thank You for giving the lowest of the low of us the hope to follow You. May you be kind and generous with us when You meet with us directly.